Stephanie Dinkins is a transdisciplinary artist who creates platforms for dialog about artificial intelligence (AI) as it intersects race, gender, aging, and our future histories. She is particularly driven to work with communities of color to co-create more inclusive, fair and ethical artificial intelligent ecosystems. Dinkins employs lens-based practices, emerging technologies and community engagement to confront questions of bias in AI, consciousness, data sovereignty and social equity. Dinkins earned an MFA from the Maryland Institute College of Art and is an alumna of the Whitney Independent Studies Program. She exhibits and publicly advocates for inclusive AI internationally at a spectrum of community, private and institutional venues. 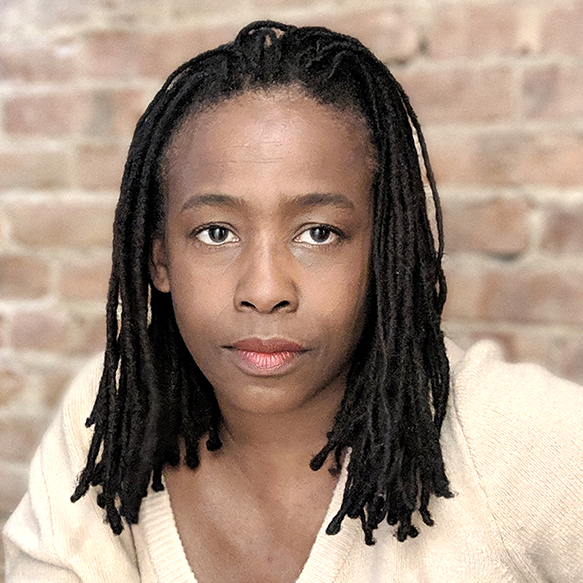 Dinkins is 2018/19 Soros Equality Fellow, Data & Society Fellow, and Artist in Residence at Nokia Bell Labs. The New York Times recently featured Dinkins in its pages as an AI influencer. Apple Inc recognized Dinkins’ research and community-centered efforts by featuring her in their “Behind the Mac” ad campaign. Wired, Art In America, Artsy, Art21, Hyperallergic, the BBC, Wilson Quarterly and many popular podcasts have recently highlighted Dinkins' art and ideas. Professor Dinkins teaches lens-based practices and emerging media at Stony Brook University. Stephanie will present an artistic work in progress called, Not The Only One (N’TOO), the multigenerational memoir of a black American family told from the perspective of a deep learning artificial intelligence (AI) In the project images, oral history and code merge with a deep concern for the preservation of nondominant histories in our collective, computationally mediated future to create a prototype of an iterative conversational AI archive trained on extensive interviews (data) between three generations of women from her family. One might imagine a highly customized Amazon Alexa that has a culturally specific voice, tells stories from a particular cultural vantage point and attempts to protect community privacy and data sovereignty through data localization. N'TOO is a prototype for what is possible in community-derived and cared for digital archives. It strives to create a new type of artificially intelligent narrative form that also serves as a dynamic record of the information, ideas, and beliefs a given community holds dear.